The years between 1943 and 1954 marked the magical era of the All-American Girls Professional Baseball League--which proved beyond doubt that women can play hardball. With skill and style, more than 500 women took to the baseball diamonds of the Midwest, dazzling fans and becoming a visible and supported part of our national pastime. In the words of "Tiby" Eisen, leadoff batter for the Fort Wayne Daisies: "We played ball just like the big boys, we broke up double plays with spikes held high and we stole bases in our skirts. We did whatever it took to win." Among those cheering was ten-year-old Susan Johnson, a loyal fan of the Rockford Peaches. Four decades later she has gone back to meet her girlhood heroines and remember a sensational baseball series: the 1950 championship between the Rockford (Illinois) Peaches and the Fort Wayne (Indiana) Daisies--two of the League's most winning and dynamic teams. 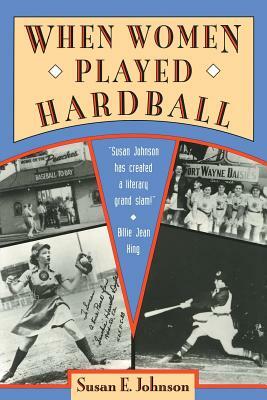 Filled with colorful stories and anecdotes by the women who played in that spectacular series, When Women Played Hardball offers an entertaining look at the culture the league created--and the society it reflected. This is a story about memories, about dreams fulfilled and dreams denied. It is a celebration of a brief yet remarkable period when women truly had "A League of Their Own."